Various services are available at Engel Chiropractic, Inc. including spinal adjustments (specific spinal manipulation performed by a chiropractor), spinal decompression, myofascial release, interferential electrotherapy, hot and cold packs, cervical traction, lumbar traction, extremity manipulation, orthotics evaluation, therapeutic exercise activities and nutritional consultations. 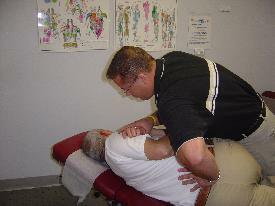 The primary spinal manipulation techniques that Dr. Engel utilizes are Diversified, Flexion Distraction and Thompson (Drop). Dr. Engel employs a variety of these gentle procedures and techniques based on each individual patient's history and clinical findings. Products available to our patients at Engel Chiropractic include Biofreeze and PowerStep arch supports, heel lifts, lumbar cushions, cervical pillows and lumbar support belts. Engel Chiropractic, Inc. is equipped with on-site x-ray in order to obtain necessary x-rays as soon as possible. X-rays can be ordered, taken and read on the first visit to our office. X-rays of the area of complaint are only taken if necessary based on the patient's history and clinical findings. The information obtained from the x-rays help Dr. Engel to further assess the patient's condition and to allow for an accurate diagnosis and prognosis. Additionally, the information obtained from the x-rays aids Dr. Engel in his selection of treatment options. In addition to chiropractic care, Engel Chiropractic, Inc. places an emphasis on rehabilitating injuries of the spine, shoulder, elbow, hip, knee and ankle so that healing can occur in the most optimal manner. Strengthening weak and injured areas is of prime importance in order the fully regain functional capabilities and to minimize the chance of future recurrences. For patient convenience, Engel Chiropractic, Inc. has a supervised one on one SYNERGY program which makes it easy for patients to follow thru with therapeutic exercise recommendations. After the in-office rehab program is complete, patients have the option of continuing their progress with an easy to follow at-home program. We provide spinal correction utilizing gentle chiropractic techniques. Never in the history of chiropractic have we been able to provide the level of help and expertise that now exists. These newer correction methods are even safer, more comfortable and more effective than ever before. As a Doctor of Chiropractic, Mark Engel has years of training and experience in spinal adjustment. We provide specific recommendations on nutritional supplements and healthy food choices to enhance our patient´s return to optimal health. Do you know which supplements and vitamins are good for you? Do you know how these supplements and vitamins interact with one another? Mark Engel can provide a structured nutritional program based on your individual needs.